Of all futuristic technological advances introduced in Star Trek, none has captured the imaginations of generations of viewers as has the Transporter. 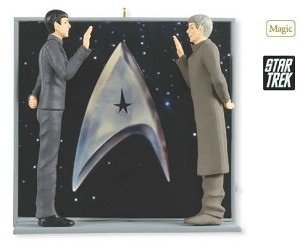 New for this holiday, our Transporter tabletop decoration features Captain Kirk, Mr. Spock and Dr. McCoy ready for another off-ship adventure. Press the button to hear dialogue and sound effects from the original Star Trek television series set to a synchronized light show. Connect to the included power adapter to see the continuous light effect. Magic Light and Sound Christmas table decoration. Connect this table decoration to the power adapter (included) to see the continuous light effect. Press the button to hear dialogue from the original “Star Trek” television series and see a synchronized light show. Plugs into a standard 120-volt wall outlet, no batteries needed. Artist crafted by Rodney Gentry, this Christmas table decoration comes pre-packaged in a box for easy gift giving, preservation and storage. Dated 2019 in copyright. Plastic Christmas table decoration is lead-free and measures 7.3″ W x 7.6″ H x 7.7″ D.
Star Trek™ The Transporter Tabletop Decoration With Light and Sound. 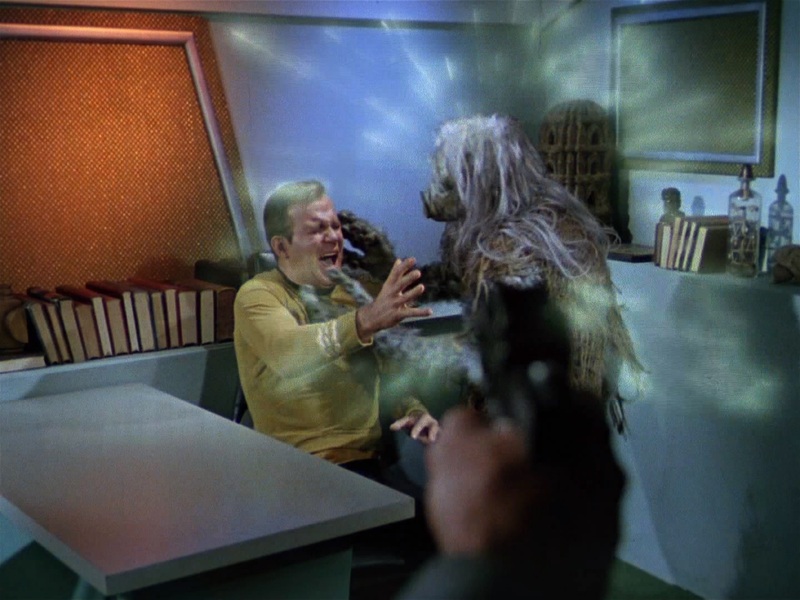 This entry was posted in 097) 2019 Tabletop Transporter, 2019, Kirk, McCoy, Scenes, Spock, ST: TOS (TV) on October 7, 2018 by garfieldandtrump. Bonding through their connections to their former captain, Michael Burnham and Commander Saru share a meaningful moment. Press the button on the ornament to hear dialogue from the memorable episode “Choose Your Pain” of the CBS All Access series “Star Trek: Discovery” (battery-operated). 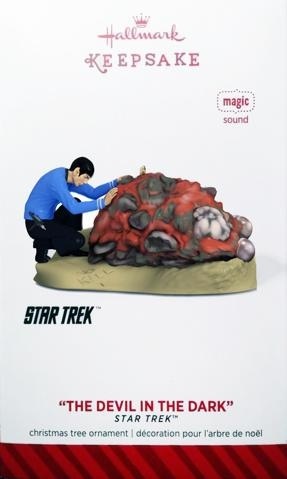 * Magic Sound Christmas tree ornament. Press the button on the ornament to hear memorable moments from this scene. Battery operated. Requires two (2) LR44 batteries, included. * This artist crafted Christmas tree ornament comes pre-packaged in a box for easy gift giving, preservation and storage. Dated 2019 in copyright. * With unparalleled artistry and exceptional detail, each festive and collectible Keepsake Ornament is made for years of celebrations. From preserving precious memories to commemorating special milestones and interests, there’s a Hallmark ornament for everyone on your gift list. * Hallmark has been your family-owned creator of greeting cards, gifts, gift wrap and more for over 100 years. We take deep pride in helping individuals connect in just the right way. 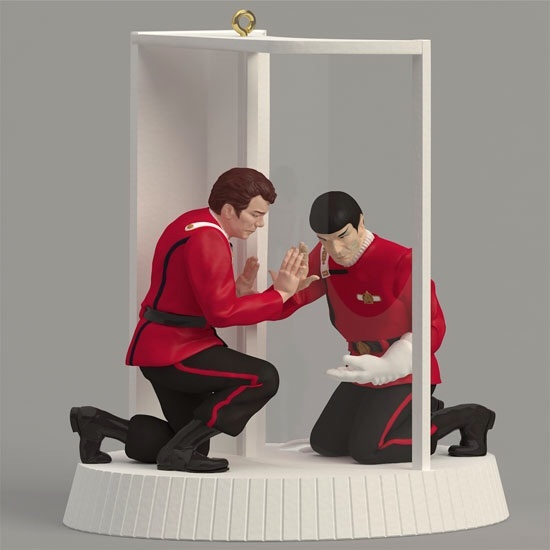 * Plastic Christmas tree ornament is lead-free and measures 2.75″ W x 5.31″ H x 2.5″ D.
Lt. Saru and Michael Burnham from Star Trek: Discovery’s fifth episode Choose Your Pain. This entry was posted in 095) 2019 Saru & Burnham, 2019, Burnham, Ornaments by Year, Saru, Scenes, ST: DIS (TV) on August 2, 2018 by garfieldandtrump. 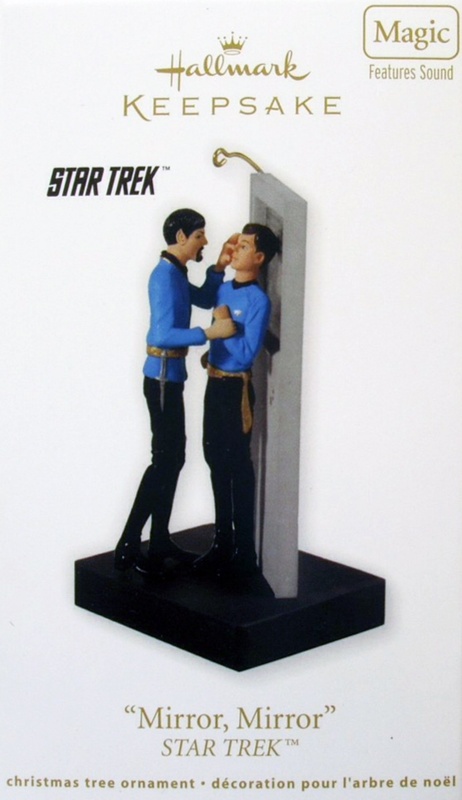 Trekcore has revealed the first 2018 Hallmark Star Trek ornament and it is “The Naked Time”! The preview was seen at this week’s Star Trek Las Vegas. You may remember in August of 2016 “The Naked Time” had the best odds of being converted into an ornament at 3:1. See what else was was on our list of most likely ornaments! What else will 2018 bring from Hallmark? A U.S.S. Discovery perhaps? 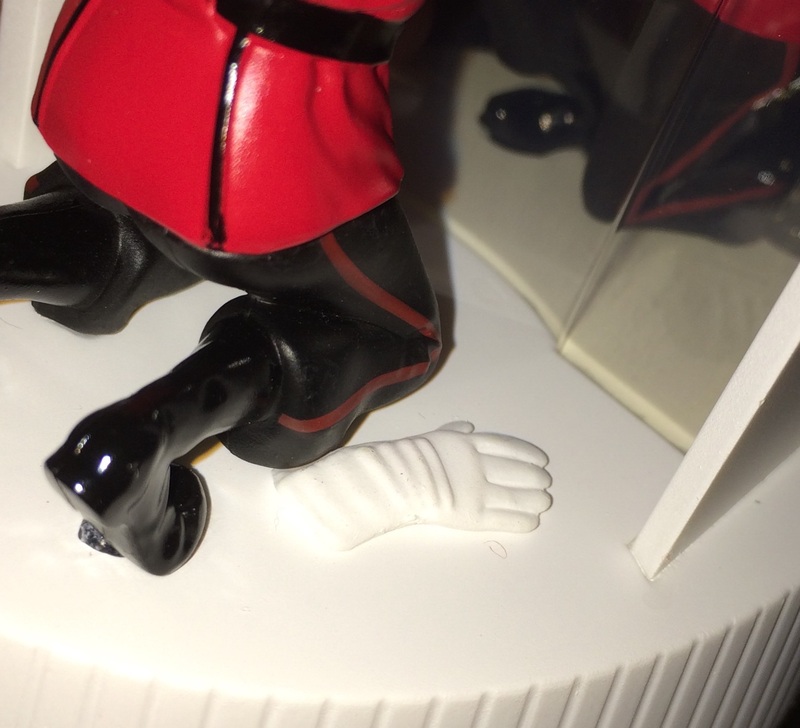 Possibly a Deep Space Nine ornament to celebrate its 25th Anniversary? We will see. This entry was posted in 086) 2018 The Naked Time, 2018, Battery, Convention News, Hallmark News, Kirk, Ornaments by Year, Scenes, ST: TOS (TV), Sulu on August 3, 2017 by garfieldandtrump. 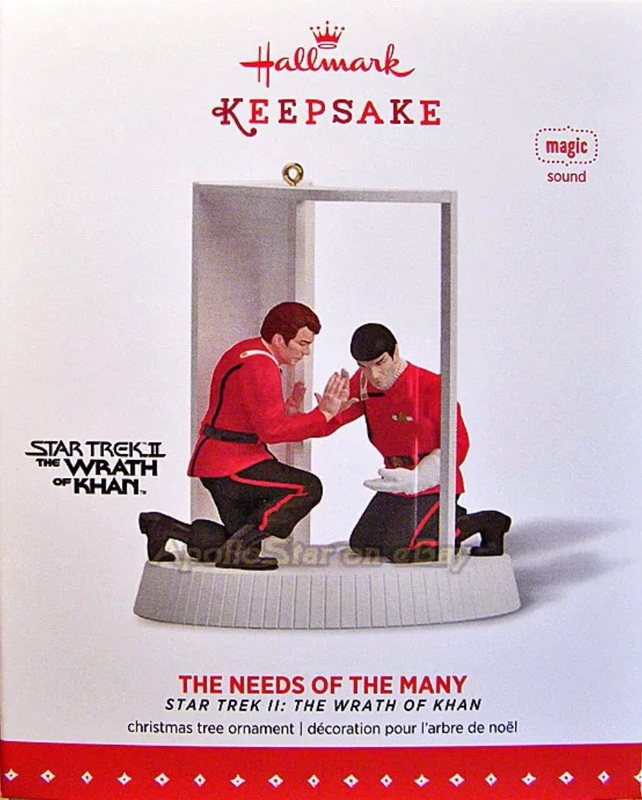 A Christmas ornament that captures the essence of operations aboard the bridge of the USS Enterprise NCC 1701-D with Captain Jean-Luc Picard at the helm? Make it so! Fans of STAR TREK: The Next Generation™ won’t want to miss this cool decoration that also features beloved android Lieutenant Commander Data and dialogue from the show. Battery-operated sound feature includes two replaceable LR44 batteries. Learn more about Keepsake Ornaments. Press button to hear dialogue from the TV series. Battery operated. Two (2) LR44 batteries included. Pre-packaged for easy gift-giving, preservation and storage. 2017 is the 30th anniversary of the premiere of Star Trek: The Next Generation. Plays dialogue from the Star Trek: The Next Generation television series. This entry was posted in 083) 2017 Picard/Data, 2017, Battery, Data, Magic Sound, Master List, Ornaments by Character, Ornaments by Era, Ornaments by Theme, Ornaments by Year, Picard, Scenes, ST: TNG (TV), Uncredited and tagged 2017 Star Trek Ornaments, Christmas Ornaments, Hallmark, Hallmark Ornaments, Star Trek on November 27, 2016 by garfieldandtrump. 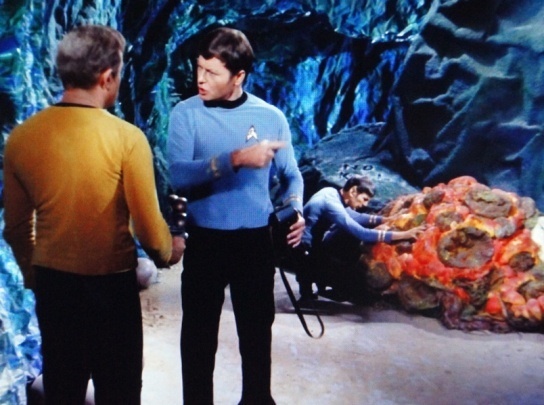 First airing back in 1966, the first Star Trek™ episode to be broadcast featured the crew’s visit to an outpost to conduct medical exams, only to be attacked by a murderous shape-shifting alien, the Salt Monster. 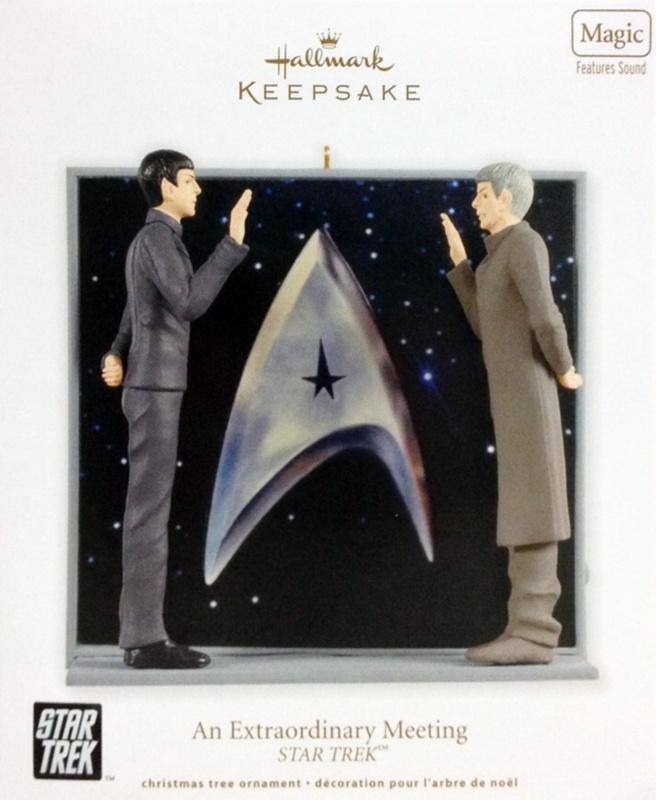 Press a button on this Keepsake Ornament to hear dialogue from this famous episode. Plays dialogue from this exciting scene. The M-113 salt vampire from the first episode of Star Trek on September 8, 1966. This entry was posted in 077) 2016 Man Trap, 2016, Battery, Jake Angell, Kirk, Magic Series, Magic Sound, Master List, Ornaments by Artist, Ornaments by Character, Ornaments by Era, Ornaments by Pwr Source, Ornaments by Series, Ornaments by Theme, Ornaments by Year, Salt Monster, Scenes, ST: TOS (TV) on July 9, 2015 by garfieldandtrump. When the U.S.S. Enterprise whisks its crew away from certain doom at the climax oh the 1982 film Star Trek II: The Wrath of Khan, Captain James T. Kirk soon learns the grievous news that Spock, his revered first officer and trusted friend, has sacrificed his life to save the starship. Their farewell is still regarded among the most moving and iconic moments in all of Star Trek – even after more than three decades. 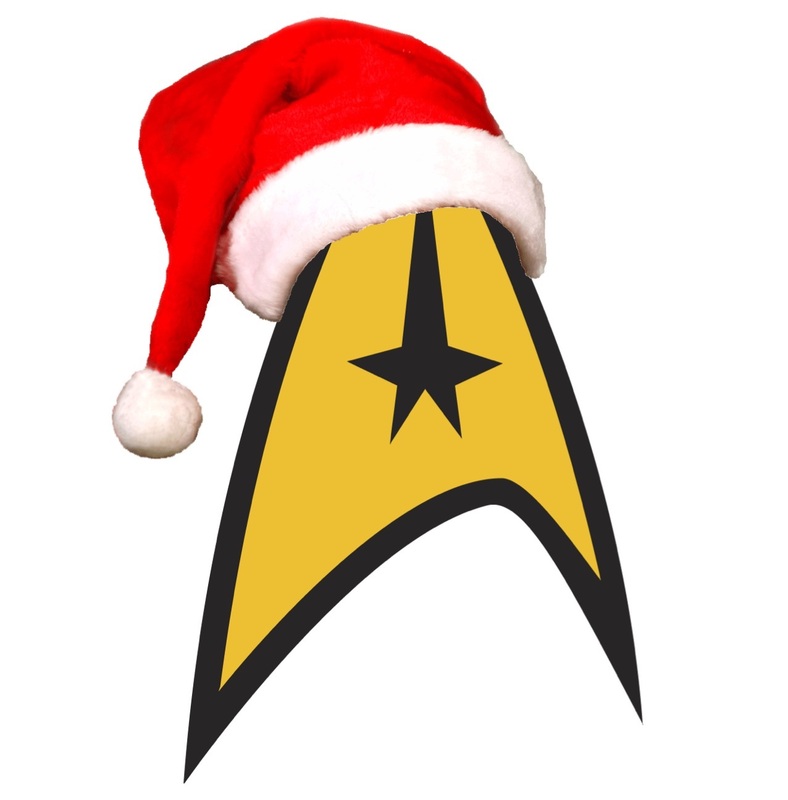 This entry was posted in 074) 2015 Needs of Many, 2015, Battery, Kirk, Magic Sound, Master List, Ornaments by Artist, Ornaments by Character, Ornaments by Era, Ornaments by Pwr Source, Ornaments by Series, Ornaments by Theme, Ornaments by Year, Scenes, Spock, ST: TOS (Films), Valerie Shanks, Wrath of Khan on July 25, 2014 by garfieldandtrump. Mr. Spock was admired for his logic, but he was also empathic, and he used both traits to try to understand the many beings the staff of the U.S.S. Enterprise encountered in their intergalactic travels. 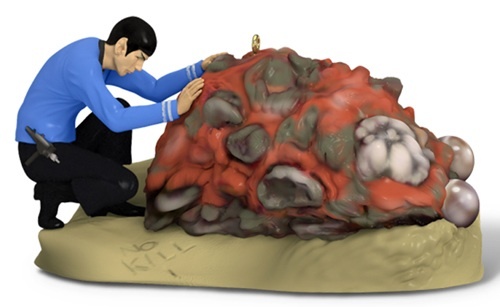 This magic ornament commemorates the 1967 Star Trek episode, “The Devil in the Dark,” where Mr. Spock communicates with a Horta. Simply press the button on the ornament and you can hear dialogue from this scene. Press the button on the ornament to hear dialogue from this exciting scene! This entry was posted in 070) 2014 Devil in Dark, 2014, Battery, Magic Series, Magic Sound, Master List, Ornaments by Artist, Ornaments by Character, Ornaments by Era, Ornaments by Pwr Source, Ornaments by Series, Ornaments by Theme, Ornaments by Year, Scenes, Spock, ST: TOS (TV), Valerie Shanks on July 21, 2013 by garfieldandtrump. This 2013 Hallmark Keepsake Ornament is a Gold Crown Exclusive. 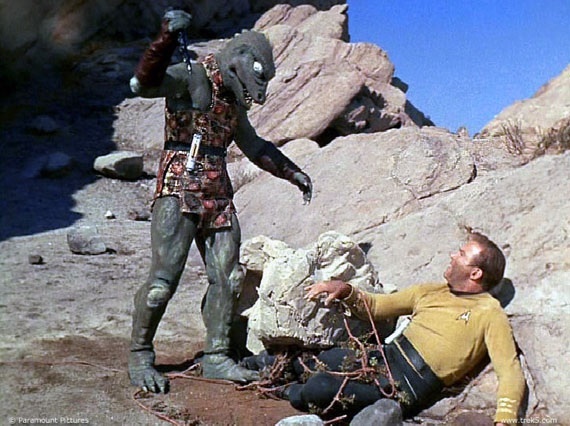 Relive the excitement of one of the most iconic moments in all of Star Trek—the struggle between Kirk and the Gorn, depicted in the 1967 episode Arena. 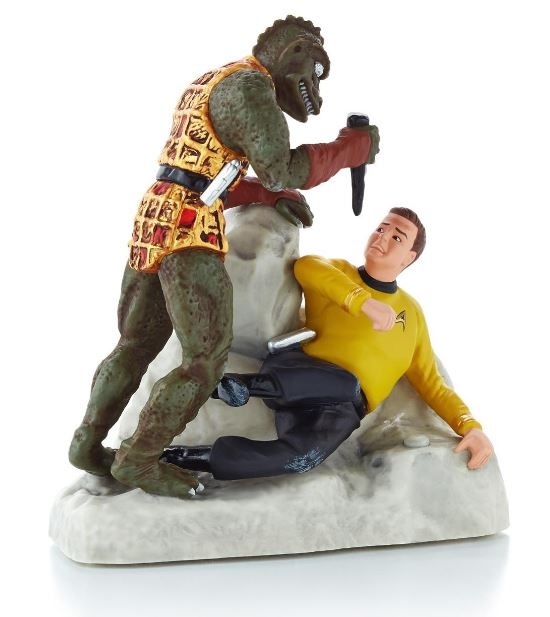 Press the button to hear music and sound effects from this iconic scene with the Gorn! This 2013 Keepsake Ornament is battery operated. 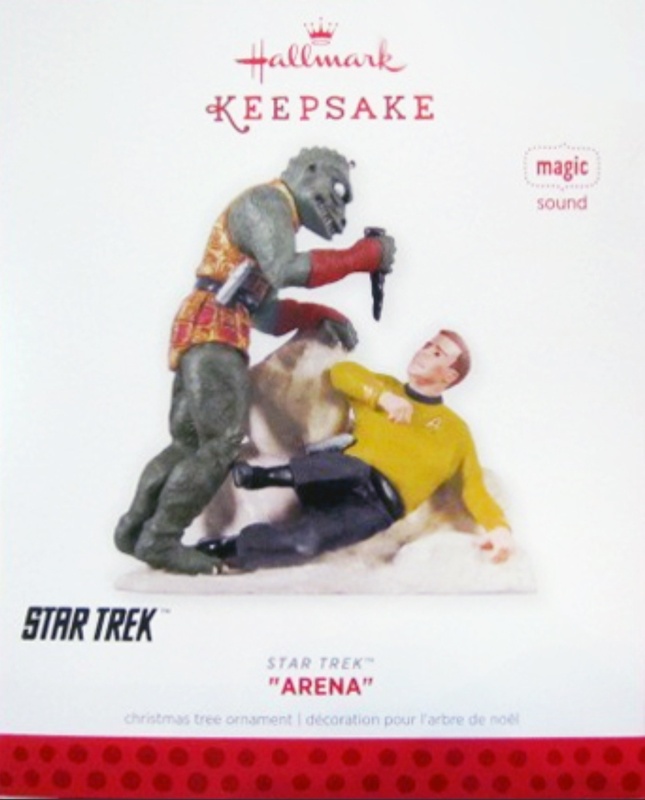 This entry was posted in 067) 2013 Arena, 2013, Battery, Gorn, Kirk, Magic Series, Magic Sound, Master List, Ornaments by Artist, Ornaments by Character, Ornaments by Era, Ornaments by Pwr Source, Ornaments by Series, Ornaments by Theme, Ornaments by Year, Scenes, ST: TOS (TV), Valerie Shanks on July 21, 2013 by garfieldandtrump. 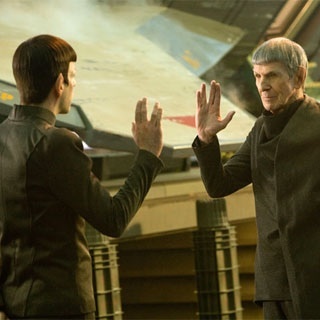 In the 2009 feature film Star Trek, Spock finds an unexpected and understanding ally in the form of his future self. 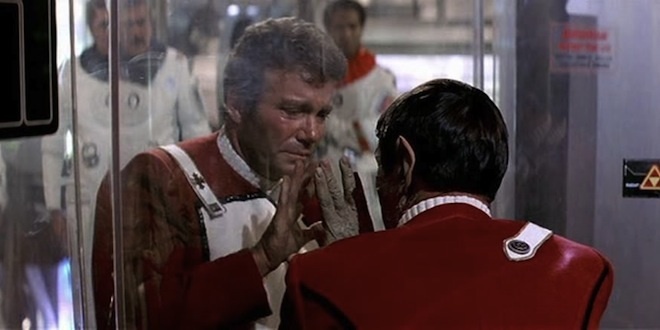 As the young Spock comes to grips with the death of his mother, the destruction of his home world, and the displacement of his people at the hands of a madman, the elder Spock reaches out with the support that no other being could offer. Press the button on the ornament to hear dialogue from this excitiing scene! This entry was posted in 063) 2012 Extr. Meeting, 2012, Battery, Magic Series, Magic Sound, Master List, Ornaments by Artist, Ornaments by Character, Ornaments by Era, Ornaments by Pwr Source, Ornaments by Series, Ornaments by Theme, Ornaments by Year, Scenes, Spock, ST Reboot (Films), Star Trek 2.0, Valerie Shanks on October 24, 2011 by garfieldandtrump. Box Text: In “Mirror, Mirror” (1967), a transporter mix-up switches Captain kirk, Dr. McCoy, Scotty, and Lt. Uhura with their “evil twins” from a “Mirror Universe.” The crew members masquerade as their ruthless couterparts on the barbaric I.S.S. 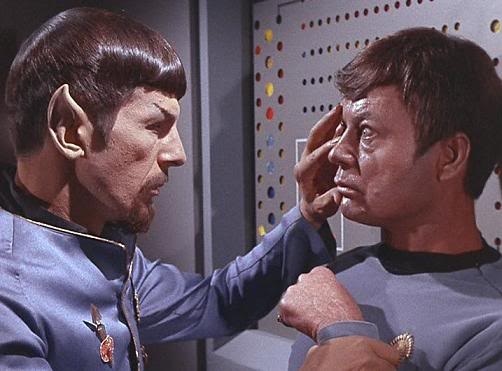 Enterprise until they make it back home with the assistance of a surprising ally, “Mirror Spock.” After discovering the switch through a mind-meld with McCoy, Spock helps put the alternate universes and their inhabitants back into logical order. This entry was posted in 059) 2011 Mirror Mirror, 2011, Battery, Magic Sound, Master List, McCoy, Scenes, Spock, ST: TOS (TV), Valerie Shanks on October 24, 2011 by garfieldandtrump. friend or be killed? 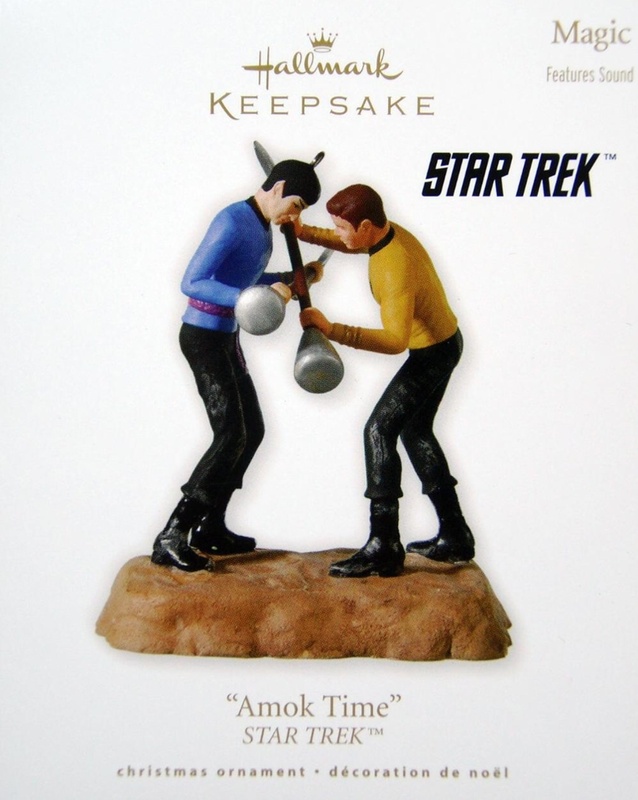 This the dilemma Captain Kirk and Spock encounter in the popular 1967 Star Trek original series episode “Amok Time.” Compelled by the Vulcan time of mating, Pon farr, Spock returns home to be married, only to find his intended has other plans. 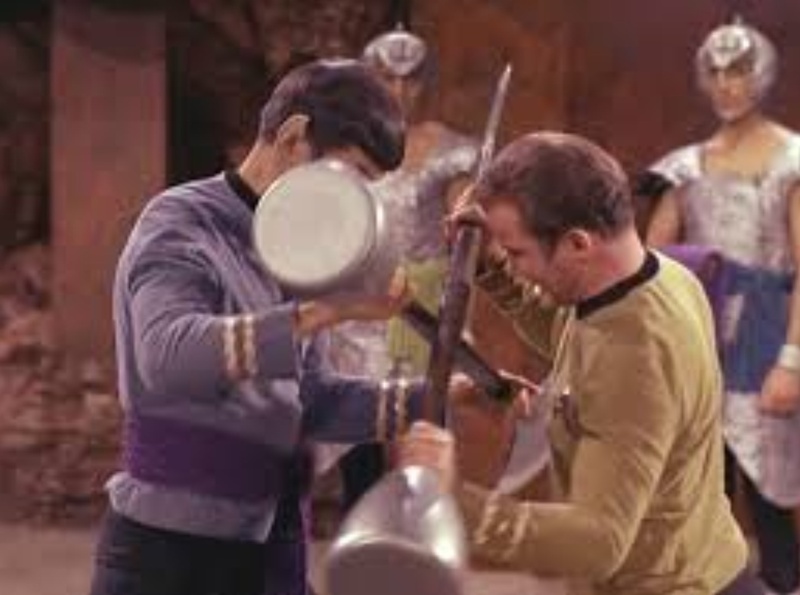 Unexpectedly, she chooses Kirk as her champion, pitting the friends in atraditional Vulcan battle … to the death! 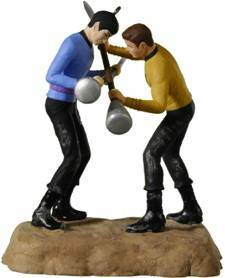 With a little medical trickery from Dr. McCoy, Spock appears to win the life-or-death struggle. 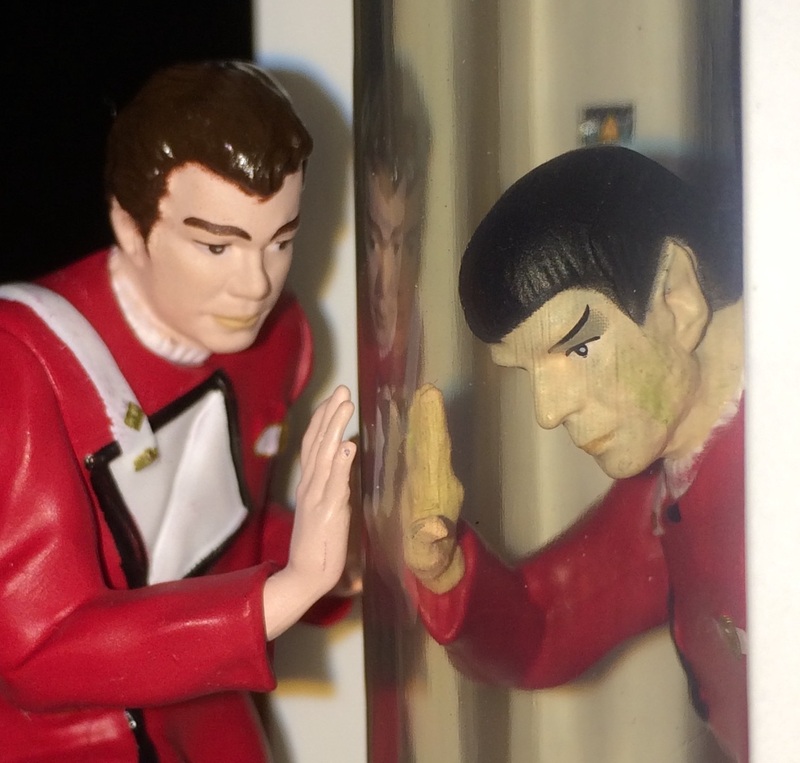 Later, upon his return to the Enterprise, Spock happily discovers that Kirk is alive and well. Press the button on the ornament to hear music from this exciting scene! This entry was posted in 056) 2010 Amok Time, 2010, Anita Marra Rogers, Battery, Kirk, Magic Sound, Master List, Scenes, Spock, ST: TOS (TV) on October 24, 2011 by garfieldandtrump.